Within the sound of the bells from the Abbey of Saint-Ferme, completely surrounded in vineyards and wonderful countryside, you will find Château du Parc, once a residence for priests. The attention to detail is superb, retaining all the original features such as the stone and marble fireplaces, oak beams, wooden floors, and the original Gironde tiles. The decor is also in the style in which one would expect in this elegant property, cosy bedrooms decorated in a romantic style with delicately matched fabrics, drapes adorning the beds and window, and wonderful old designed en suite bathrooms. All this is there to make you feel as welcome as possible. Château du Parc sits on its own in nine hectares of beautiful landscape gardens with fishponds, trimmed hedges, trees and shrubs. Restaurants to sample local cuisine are within easy access, and for the wine connoisseur, vineyards are in abundance. 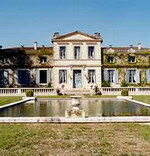 There is also an excellent choice of 18 hole golf courses all within easy reach of the Château. This XV11 Century Petit Chateau is situated on the outskirts of a quaint village, with its wonderful old Monastery, known as St. Ferme, 1hr. 10 mins. east of Bordeaux, and approx. 40mins from the famous Vineyards and Chateaux of St. Emilion. 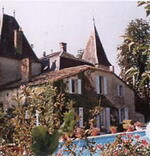 This beautiful chateau comfortably sleeps 14 people, with a small but well equipped Kitchen, housing washing machine, dishwasher, microwave, a Dining Room, Library, Lounge, on the ground floor. Swimming pool 12mtrs. x 6 mtrs. with barbeque, and plenty of garden furniture. During your stay at the Manoir St. James, a guided tour to the local vineyard has been arranged, to taste some of the best wines in the Bordeaux region. To see the power of real wealth throughout history and to enjoy a great vacation the place to visit is Bordeaux in South Western France. Located some 360 miles south-west of Paris on the Garonne River, the port of Bordeaux, capital of Aquitaine, is one of the world's most important wine-producing areas. It is a major cultural centre and a transportation hub between southern France and Spain and offers excellent hotel and resort accommodation and has a good infrastructure. Bordeaux is stunning when approached from the south along the river. It's big, with a population of over half a million, and obviously rich - as it has been since the Romans set up a lively trading centre here and has flaunted it wealth throughout history. Bordeaux's Merignac Airport is located west of the city. It's a regional airport french property for sale which serves mostly domestic flights; though there are international flights as well connecting Bordeaux to some European 'hub' airports like Paris, London, Madrid and Amsterdam. By car you can reach Bordeaux from the north (taking the A10 highway or N10), south (taking the A63 highway), and east. A beltway goes around the city. Bordeaux is not only home to superb wineries; it has some of France's best 18th-century architecture and a major fine-arts museum worth seeing when here. There's an interesting underground church, the largest one in Europe, to discover and famous wine chateaux worth a wander as well. You certainly won't be bored. To see what the power of big money could do in Medieval France visit the Cathedrale St-Andre, the largest and most ostentatious church in Bordeaux, (located near the southern perimeter of the old town). The sculptures on the 13th-century Porte Royale (Royal Door) are admirable; as are the 14th-century sculptures on the North Door. Separate from the rest of the church is the 47m Tour Pey-Berland, a belfry begun in the 15th century. The church is open July through September, daily from 7:30 to 11:30am and 2 to 6:30pm. Off-season, it's closed Sunday afternoons. Take a drive and visit Medoc (The), northwest of Bordeaux. It is king when it comes to Bordeaux's 1000 sq km wine-growing region. Some of Bordeaux' most celebrated vineyards - those of Haute Medoc, Margaux and neighboring estates - can be found in this area, making it an essential inclusion on any wine tasters trip. Go shopping on Rue Ste-Catherine property for sale in France. Over a kilometer long, this is the busiest shopping street in Bordeaux; it is also one of the town's oldest thoroughfares. In Roman times, it was a major north-south road. Today, it is still important, since it links the Grand Theatre to the Place de la Victoire. The street has borne the same name since the 18th century, in honor of the martyr saint whose chapel is located nearby. No matter how long you planned to stay in Bordeaux, you will find it is just not long enough, there is so much to do and see. That is why people who vacation in this city keep returning.